It was just like any other day in Manhattan. Innocent bystanders: men, women, and even children were walking along and minding their own beeswax. Some were on the way to work, some school, some meeting friends for coffee. Out of nowhere they were suddenly accosted by the bloody hands of zombies rising from a subway grate, accompanied by a familiar soundtrack of groans. This post-apocalyptic experiential marketing campaign has caused quite a ruckus on the Internet, after the video was released last week. The brand experience was put together on behalf of channel AMC to promote the mid-season premier of TV show The Walking Dead. 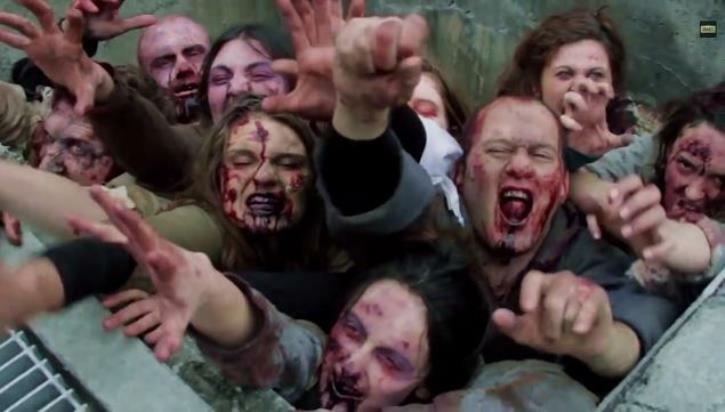 These ‘walkers’, as they’re called on the show, were really fifteen extras donning full-zombie getup, and hiding underneath the grate on 14th street at Union Square, waiting for the perfect moment to scare-vertise their victims. Hidden cameras documented the reactions as the gruesome arms appeared as if from nowhere. We’ve seen a lot of prankvertising in the last few months, especially when it comes to horror releases, and this latest scare follows in the footsteps of recent ghoulish ‘devil baby’ Devil’s Due promotion in New York. In this campaign a pram driven by remote control would swerve in front of passers-by, only to reveal a terrifying monster baby when they went to help what they thought was an innocent little ‘un. And one of our most popular posts of 2013 was about a bone-chilling setup involving ‘telekinesis’ and a coffee shop as part of a Carrie promotion. 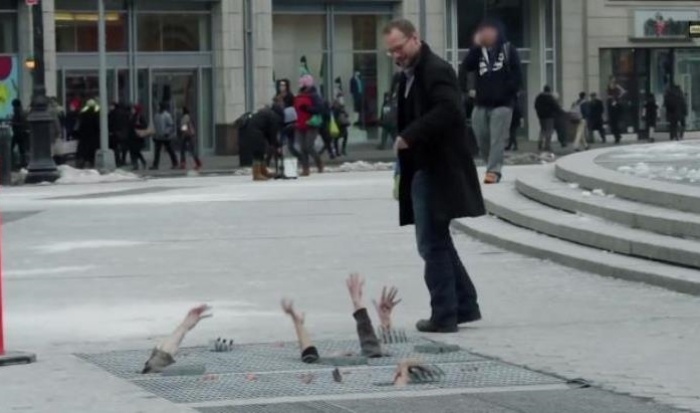 Reactions to these experiential marketing stunts vary from shock to curiosity, and the comically terrifying videos to promote the campaigns are making the viral rounds on the Internet.